Friday is the last day of school. Tomorrow H will be giving his teacher this gift we made. Well, I made -- he picked out the flower and planted it. It's painted with chalkboard paint, and was very easy to make, but turned out very cute. I hope she likes it. He had a great 1st grade year ... for sure. I think this is the cutest idea ever! Did she love it? Yes, she did. 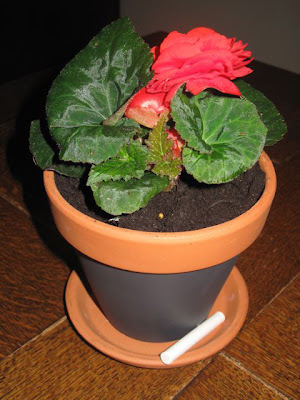 Flowers were a favorite present to teachers, I noticed, but we made it more for the pot versus the plant.